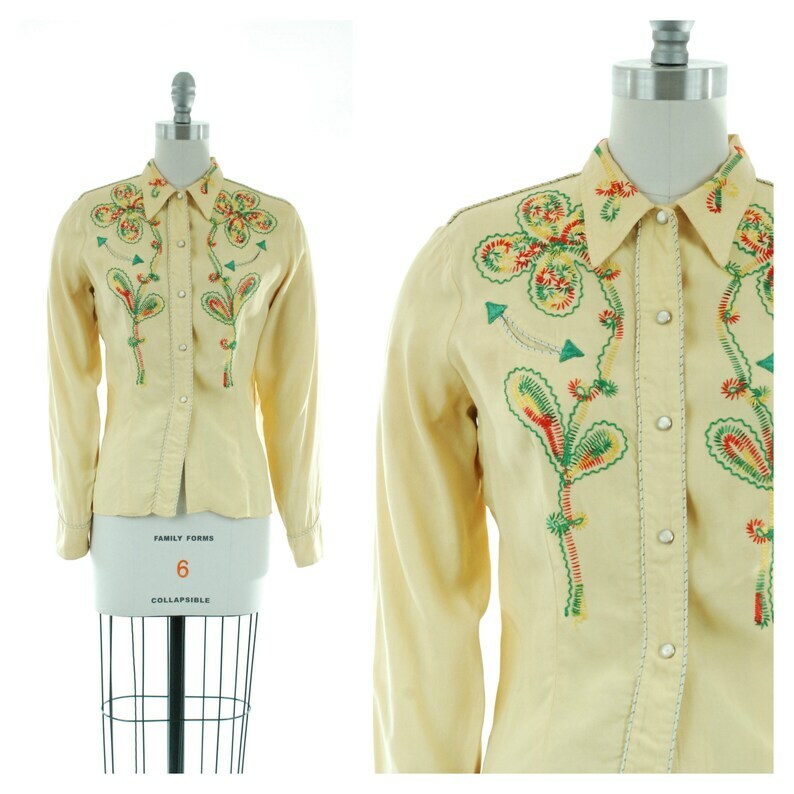 Vintage 1950s western wear blouse is absolutely wonderful in a soft, easy to wear blend of rayon and cotton. 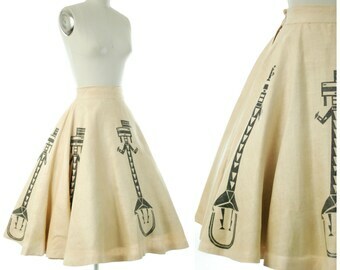 The body is a light spring yellow, the yoke trimmed with white and green piping. The collar is embellihed with a primary color embroidery that matches the body of the shirt. A green chain stitch makes the outline for embroidered multi colored cacti and flowers. The pockets are tipped with green arrows. This classic blouse closes with glossy white snaps up the front, and with five more at each of the fitted, piping trimmed cuffs. 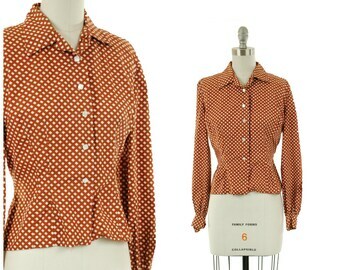 This item is part of a large consigned collection of classic vintage western wear that I am delighted to present to you! Search "western" in the shop to see the other items available, there are thirty pieces I'll be listing over the next two days! This shirt is clean and ready to wear. There are light rings at the underarm, and three small spots at the far left side of the torso. The cuffs feel just a bit dingy, but it has been cleaned, so it's just a subtle darkening from where. There is one spot at the center back of the yoke, one tiny moth chew at the back, far right and a smudge on the waist that I think was caused by a leather belt. I find no other issues to note, and this shirt still wears beautifully. It has been priced with minor flaws in mind.